Through devotion to the wise, one attains proficiency with the maximum efficiency. It is imperative for all the functionaries of the State to perform their duties with the maximum efficiency. To perform State duties with the maximum efficiency, the functionaries of the State must learn to control their sensual needs, and maximize their internal potentials. Those who have vanquished their baser selves may become prosperous naturally, can retain their prosperity, and be successful in their endeavors. Note:Utmost care has been taken in translation of the Chanakya Sutrani verses in Hindi and English, however if you have any suggestions, do let us know. We would be happy to make any changes if required. Hindi and english translation with original sansrit script of chanakya sutra. 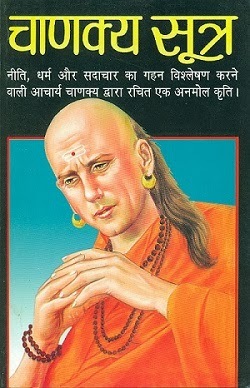 Chanakya sutra or chanakua sutrani is a great book by acharya chanakya. Must read for every age group of people.